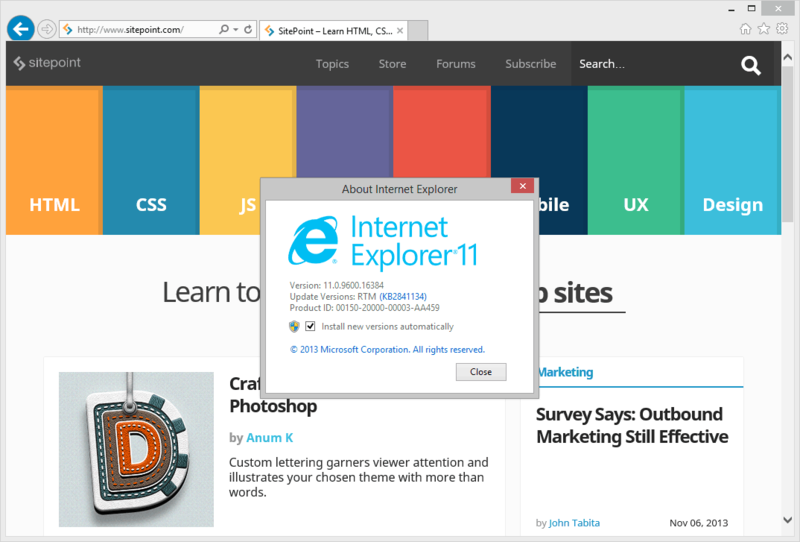 Internet Explorer 11.0 was released with Windows 8.1 on October 17, 2013 — less than twelve months after IE10. Relatively few users therefore have it installed and last month’s browser trends indicate it’s been adopted by just 0.13% of web users. That will increase rapidly when the Windows 7 version is released … which could be very soon. At the time of writing, IE11 is only available to those upgrading to Windows 8.1. If you’re using Windows 8, open the Windows Store and you should see an upgrade link. It’ll depend on your system, but expect to download around half a Gigabyte of updates — fortunately, you can carry on working, shut down or restart mid-way through the process. After download, the full upgrade takes around 15 minutes and seems painless for most. I had a couple of issues; networking failed (I needed to delete and recreate the Hyper-V virtual switch) and my SQL Server services disappeared? Another PC with less software went without a hitch, though. As a side note, Windows 8.1 is an improvement. Smaller tiles are useful and it’s easier to reach all apps. The Start button is back but it’s only a shortcut to the Start screen. Ironically, following a year of daily Windows 8 use, I don’t miss the Start button and would happily remove it — but there’s no option to do that! It may not be the prettiest browser but it’s clean, functional and permits you to concentrate on the page rather than the application. You can move tabs to a separate row and add the menu, status, command and favorites bar — but you probably won’t. While IE remains below the levels achieved by Chrome and Firefox, the missing facilities are mostly recent, niche or deprecated HTML5 features such as the Web Audio API, Web SQL Database and codec support (which may appear if you have them installed in Windows). In practice, you’re unlikely to encounter more issues in IE than you would with any other browser. The big new feature is WebGL … it seems Microsoft has overcome their security risk concerns. First impressions are good and performance appears to be better than Chrome and Firefox. There are some excellent demonstrations of the technology at babylonjs.com. You should also note that legacy APIs such as document.all and attachEvent have been binned in IE11 (see Compatibility below). For me, the only disappointment is the continued omission of transform-style: preserve-3d; when applying 3D transformations to multiple elements. It may not be essential, but it’s very useful. High DPI support — enhanced scaling for high-resolution screens. Improved Windows integration such as phone number recognition, live tiles and reading view. Pre-rendering; add rel="prerender" to any link and the page will load in the background so it’s available when the user proceeds to it. Pre-fetching; a rel="prefetch" attribute identifies resource files (not necessarily used on the page) which can be downloaded and stored in the cache. DNS-prefetch; add rel="dns-prefetch" to any link so DNS queries are resolved in the background to ensure requests can be handled faster. Network prioritization is an interesting optimization. IE11 prioritizes individual network requests by type to provide the fastest user experience and ensure the page is usable sooner. The general order is the HTML, CSS, fonts, scripts, images, synchronous Ajax requests, asynchronous script requests (Web Workers, indexedDB, File API, etc), asynchronous Ajax requests, audio/video and deferred scripts. Microsoft has been working hard on touch support to ensure HTML5 controls work well on tablets and smartphones. IE11 also complies with recent changes to the W3C Pointer Events Recommendation. The technology was introduced by Microsoft so events can be handled in a hardware agnostic way; it doesn’t matter whether you’re using a mouse, pen, touchscreen — or perhaps a certain motion sensor on a particular soon-to-be-released games console! Currently, Pointer Events are only supported in IE but Microsoft has been working with the Mozilla, Webkit and Blink communities to bring the API to Firefox, Chrome, Opera and Safari. Prototypes are already available. In general, I’ve not experienced any issues with IE and it renders as you’d expect. Unless you’re sniffing user agents. There’s no sign of “MSIE” and it’s not surprising Microsoft removed it. Some sites detect the string to make IE to show a degraded layout or switch to legacy APIs such as document.all. That sort of nonsense no longer works; IE11 is closer to Chrome or Firefox than it is to IE8. I’ve said this many, many times but, if you’re sniffing browser strings, you’re doing something wrong! There are a few exceptions such as statistics collation, but those situations are rare. IE11 is the outright winner in two tests and joint first on another. WebGL is especially impressive. Perhaps unsurprisingly, it only falls behind in Google’s V8 benchmark. Benchmarks do not reflect real usage and can be swayed to prove whatever you like. All the browsers are quick and you’ll rarely encounter performance problems. That said, IE11 is genuinely impressive; it seems to open, close and render faster than any other browser. If you switched to Chrome for speed alone, you’re now using the wrong browser. It’s possible Windows 8 has other background processes running which aid IE11, but I couldn’t find any obvious candidates. Firefox is a little hungrier and Chrome is a resource glutton which also started around twenty sub-processes! The only downside is that IE11, like Chrome, will reload all your tabs when the browser is restarted. I’m surprised neither Microsoft or Google has followed Mozilla’s lead in only downloading on demand. IE’s range of add-ons remains disappointing compared to the Firefox, Chrome and even Safari eco-systems. The majority are commercial extensions which have little practical benefit. But is that a problem? If you want a highly-customizable browsing experience, Firefox is the undisputed champion with thousands of add-ons which can change any aspect of the application. If you only require a few basic enhancements, Chrome has a good range of extensions with more limited capabilities. Is Internet Explorer 11 the best option for users who just want a fast browser without the frills? My advice to Microsoft: scrap IE’s extension systems. Few companies create IE add-ons and it would be difficult to entice power users from Firefox and Chrome. Keep IE lightweight and stop users accidentally installing dubious toolbars! 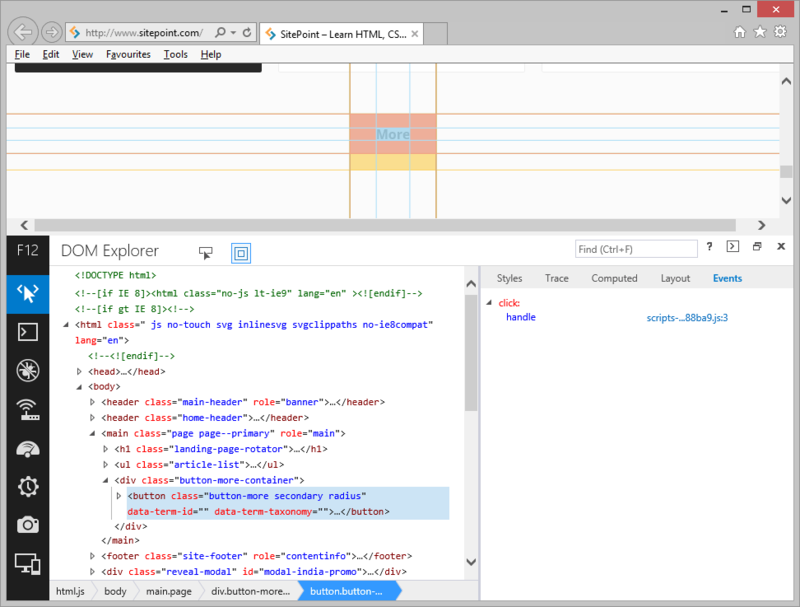 I’ve been critical of IE’s developer tools in the past but they’ve been completely overhauled in IE11. a full console API for logging, tracing etc. perhaps the best-looking developer tools on any browser? If you’re using Firebug, Firefox’s Developer Tools, or Chrome’s Inspector you’ll be more than happy using the new F12 tools. If I had to be hyper-critical, it would be nice if you didn’t have to click icons to begin some profiling options, but that’s a minor niggle and I guess it’s been implemented for performance reasons. I’m no longer convinced IE requires a beautiful interface or better a add-ons system, so that’s another two points down. While it would have been great if they’d done something for XP users, the problem has lessened over time. That leaves one: introduce a rapid release schedule. Microsoft has been reducing the schedule every release but I would still like to see an incremental set of updates or perhaps a new release every six to eight months. We still need to deal with older versions of the browser. It feels strange saying it, but Internet Explorer 11 is an amazing browser. Don’t be blinkered by the past; if you want a fast, streamlined, standards-compliant browsing experience, swallow your pride and try IE11.